Nearly two months after United Airlines said it would turn back the clock and start providing passengers with free nibbles, American Airlines is also jumping on the snack bandwagon, once again offering complimentary treats — and, on some flights, free meals — to economy-class travelers. Earlier today, American announced that this return to the glory days of free inflight snacks will roll out to travelers on select flights in the coming weeks. The airline’s transcontinental flights from New York to Los Angeles and San Francisco, and from Miami to Los Angeles will the be the first to offer an array of complimentary snacks. The carrier’s other domestic flights are expected to distribute the free treats in the main cabin by April. 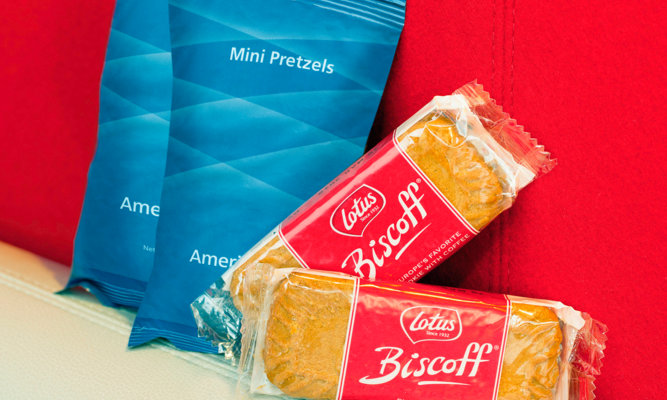 As with United’s snack selection, the time of day will determine which treat passengers receive on American. Flights departing prior to 9:45 a.m. will be stocked with Biscoff cookies, while travelers on flights after 9:45 a.m. will have a choice between the Biscoff cookies or pretzels. If a quick snack isn’t enough to hold you over on your trip to Hawaii, starting in May, American will offer complimentary full meal service in the main cabin for all flights between Hawaii and Dallas/Fort Worth. In addition to upping its snacking game, American announced Tuesday that it would also boost its entertainment offerings. Flights equipped with in-seat televisions will now have 40 movies, 60 TV shows, and 300 music albums for passengers to choose from.